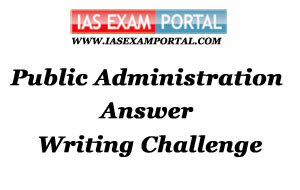 Weekly Mains Exam 2016 Answer Writing Challenge - Public Administration "MODULE- 58" | IAS EXAM PORTAL - India's Largest Community for UPSC Exam Aspirants. Weekly Mains Exam 2016 Answer Writing Challenge - Public Administration "MODULE- 58"
Public Administration- Paper I "Syllabus Topic – Administrative Thought: Human Relations School (Elton Mayo and others)"
Q1. Explain the basic characteristics and functions of an informal organization in a formal setting with its significance for public organizations. Indian Administration- Paper II "Syllabus Topic –Philosophical and Constitutional framework of government : Salient features and value premises"
Q2. Over-dependence on bureaucracy for bringing about socio-economic development in India has proved to be dysfunctional. Comment. The Socio economic development of India has taken a path where the goals and objectives are arrived at by the incumbent political executives, however the mandate of implementation lies with the bureaucracy that is directly engaged in the process of administration till the grassroots level. The bureaucracy however is not a direct representative of the people and may sometimes not represent the will of the people but rather of their political masters. In the Indian context it is often found that since the promotions, transfers suspension etc of the bureaucrats are determined by the political executive the measures taken by these officers do not uphold the principles of creating an enabling socio-economic environment but rather one that ensures political stability. However, not all bureaucrats have proved to be dysfunctional. Since administration has direct contact with the people, they are able to identify positive social innovation that comes from the voluntary sector and have the administrative acumen to scale up such activities to meet the goals of socio economic development. Some promising examples are of Anil Shah from the Gujarat cadre who was first executive director of Aga Khan Rural Support Programme which did some ground breaking work in Joint Forest Management and watershed development. Another example is where a bureaucrat, Meethalal Mehta designed the Antyodaya programme for livelihood generation. This design was later replicated by the Indira Gandhi government and initiated as a pan India Integrated Rural Development Programme which later was known as Swarnjayanti Gram Swarozgar Yojana and currently as Ajeevika. Poverty alleviation programme called Kudumbashree in Kerela was also initiated by a bureaucrat that created a federation of voluntary organizations and gave them access to credit services and bank linkages. Velugu, another organization started by a bureaucrat A. Raju along with support from Shoaib Sultan Khan from AKRSP (Pakistan) reached out to 12 million households through women self help groups. Therefore, we can see there is huge potential for bureaucrats to contribute to the process of socio economic development but there is always the fear that these good practices can be usurped by the incumbent political executives in increasing their popularity with the masses or with changing political executives a systematic decline in such initiatives.